Terence Davis had a double-double with 26 points and 12 boards against Florida. Photo by Joshua McCoy / Ole Miss Athletics. 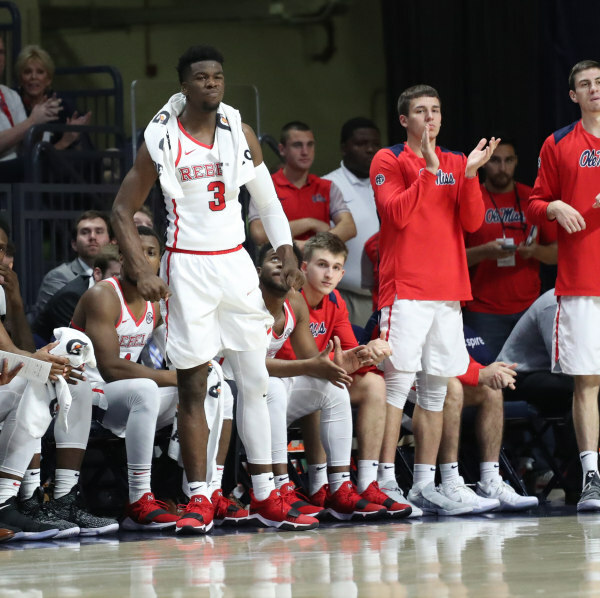 The Ole Miss Rebels basketball team dropped a barnburner on the road in overtime 90-86 to the Florida Gators. Ole Miss (14-5, 4-3) had a 76-73 advantage over Florida with 8.8 seconds remaining in regulation when Gator KeVaughn Allen drained a 3-pointer with 2.7 seconds left. The freshman guard’s shot sent the game into overtime. Florida took a 7 point advantage in overtime, 86-79, before the Rebels were able to come back within 5 points. With seconds on the clock Ole Miss sent the Gators to the charity stripe to extend the game but were unable overcome the deficit. The Rebels were led in scoring by senior Terence Davis with 26 points and 12 rebounds. Davis was joined in double figures by junior Breein Tyree with 20 points while freshman KJ Buffen added 17 points of his own. Florida (12-8, 4-3) took a 33-30 lead into the locker rooms at halftime after a slow start to the first 20 minutes of action. The Gators’ Noah Locke led all scorers with 22 points for coach Mike White’s squad. Coach Kermit Davis’ Rebels went 22-26 from the charity stripe in the game and hit 46.0 percent from the field. In the second half, Ole Miss shot 59.3 percent. Florida held Ole Miss to only 6 3-pointers made out of 23 attempts on the night. Ole Miss out rebounded Florida 43-27 on the night and was able to pull down 16 offensive boards to the Gators 8 rebounds. The Rebels return home on Saturday as they welcome their in-state rival No. 22 Mississippi State. Tip-off is set for 2:30 p.m. on the SEC Network.